As promised in the previous post here is Mary Katherine Goddard’s petition requesting that she be reinstated as postmaster at Baltimore. She applied to President George Washington who declined to intervene, as did the postmaster general. She then sent the petition to the Senate on 29 January 1790. That She hath been discharged without the smallest imputation of any Fault, and without any previous notice whatever, ‘till an Order arrived … to deliver up the Office to Mr. White, the Bearer of his note, & although he remained several Days in town, yet he did not think proper to indulge her with a personal interview, whereby she might learn the cause of her removal, or to what motives, it could possibly be ascribed. Such a Procedure contrasted with her conduct in Office, and the approbation of the public … leave no room to question, either her inclination or ability to discharge the duties of her appointment. And further, as it has been universally understood that no Person should be removed from Office under the present Government, unless manifest misconduct appeared, and as no such charge could possibly be made against her, with the least colour of Justice, she was happy in the Idea of being secured both in her employ & the protection of all those who wished well to the federal Cause: And if it should so happen that she should be obliged to make room for one of more worth, or interest, that she would notwithstanding be allowed a reasonable time to prepare for the Event. That although it has been suggested that the Income of her Office for a few years last past, has made her amends for her former assiduity care and expence, yet She would beg leave to observe, that from the many failures which have distressed the Community since the Peace, She has met with her Share of losses and misfortunes, a Truth well known to all her Neighbours; And now to deprive her of this Office, to which She has a more meritorious & just claim than any other person, is a circumstance, pregnant with that Species of aggravation, which a Sense of Ingratitude inspires & which is much easier felt than described. She therefore humbly hopes that the honorable the Senate will take her case into their serious Consideration, & grant her such Assistance, as may be in their Power, in restoring her to the public Confidence & the Enjoyment of her former Office. Goddard’s petition was not successful. 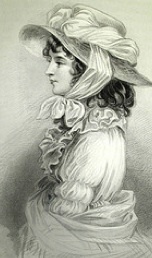 Mary Katherine Goddard is described on page 46 of In the Words of Women. Her petition can be found HERE. Although appropriate roles for women during the eighteenth century were wife and mother, interest, ability, and circumstance led some to go into business—as apothecaries, dressmakers, midwives, or shopkeepers. A few went into publishing and printing, most collaborating with husbands or sons, but often assuming control when the males died or went on to other activities. One of these was Mary Katherine Goddard. Born in Connecticut, Mary Katherine and her mother moved to Rhode Island where her brother William started a printing business with money supplied by his mother. When William was away the two women carried on, printing The Providence Gazette as well as pamphlets, almanacs, and even books. Mary Katherine’s brother described her as, “an expert and correct compositor of types.” In 1768, mother and daughter joined William in Philadelphia where he established The Philadelphia Chronicle. After her mother’s death Mary Katherine kept the business going. In 1773, William started another paper in Baltimore called The Baltimore Journal. Mary joined him and for the first time her name appeared on the masthead. In 1775, she became the first female postmaster in the colonies—her father, a medical doctor, had been postmaster in New London, Connecticut. When independence was declared, the document that circulated did not at first include the names of the signers as their act could be considered treasonous and their lives endangered. In January of 1777 when the die was cast, Mary Katherine published the first copy of the Declaration that included the signatories’ names. As editor she resisted attempts to control the content of the newspaper; she tried to be objective and professional. 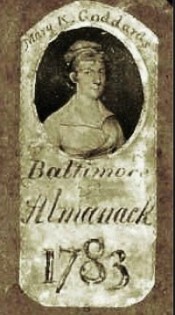 She continued to publish almanacs; the one for 1783 included her image. After disagreements with her brother she was forced out of the Baltimore business. A second blow came when, under the new federal government, Mary Katherine was relieved of her position as postmaster in Baltimore. The reason given was that the post required “more traveling … than a woman could undertake”. The postmaster general replaced Goddard with a man who was also a political ally—the beginning but not the end of the postal service’s patronage system. Mary Katherine fought to be reinstated, submitting a petition endorsed by many Baltimore businessmen, to President Washington and Congress. Her attempt failed. To support herself Goddard ran a bookstore in Baltimore until 1802 and lived in that city until her death in 1816. Before she died she freed her single slave, a woman named Belinda, and left her all her possessions and property. Look for excerpts from Mary Katherine Goddard’s petition in the next post. Read more about Goddard HERE and HERE. When war came, John was sent to Spain to secure support for the Revolution. Sarah accompanied him, and the pair were together in Europe for more than four years, moving from Madrid to Paris, where John helped negotiate the treaty that ended the War. In 1784, John, Sarah, and two daughters born abroad returned to New York rejoining their son Peter whom they had left in the care of Sarah’s parents. Now minister for foreign affairs for the government established by the Articles of Confederation, John often had to travel to Philadelphia where Congress was based. Once again letters became the lifeline between husband and wife. The inst. I told Peter that you wd. be happy to receive a line from him, he ran for his pens & without hesitation began his letter; & I was very much pleased to observe that he wrote without study or difficulty as if happy in an opportunity to evince his obedience. This evening the post will arrive, & I flatter myself that in the mail there is a little messenger of Love to gladden my heart & keep alive that softener of absence, all-chearing hope. Have you recd. my letter of the 21st. inst.? If you have, I suppose in yr. next I shall be favor’d with directions about Peter’s schooling. Don’t you think it wd. be well to write to Mr. Barclay to inquire whether he ever heard of the safe arrival of our China at Havre de Grace & if he has, to whom it was consigned. Perhaps if we know in whose care it was, Mr. Swanick might put you in a way to get it to Philadelphia. . . .
Our little ones grow charmingly & are daily more interesting. The more I observe Peter, the more striking I find the resemblance he bears to his Grandfather. Mamma & family desire to be affectionately remembred to you: please to present my Compts. where you know my esteem is already placed. My Love is all your own. Farewell & happiness attend you.Sa. JayOnly think of the naughty Post! Not a line: the next will be more favorable. The letter is from Selected Letters of John Jay and Sarah Livingston Jay, pages 32 and 167-68. Portrait thought to be by Robert Edge Pine, 1770s, copy at the New York Public Library. To Sarah Jay, living abroad with her husband John, the American minister plenipotentiary to Spain during the Revolution, letters from home were her only link to family, friends, and country. She kept a careful account of those received and sent and suspected that many had been lost. In this letter she thanks her sister Kitty for being her most faithful correspondent. Madrid, 1 December 1780I am at this instant overjoy’d with the rect. of three charming long letters from you just handed to me, which added to those I had recd. before makes eleven that I return you my sincere thanks for: sister susan has wrote me one letter, & one I’ve been favor’d with from Mrs. Meredith, not a single line has reach’d us from any of the family at Fishkill [the Jays]. Thus you see how extravagantly kind you have been, & how highly we must value your correspondance. I willingly flatter myself that even those of my friends who have not time to throw away in writing to me, may yet have no objection to hear that I’m still in the land of the living, & therefore have taken the liberty of introducing myself to their recollection by scribbling to them. Whether or not my letters have been lost I can’t tell, tho’ I almost believe they have since they have not provok’d an answer. You alone seem sensible of the interest I take in the concerns of my friends, since but for your letters I should remain in ignorance of any alteration that takes place in my absence. This excerpt is from Selected Letters of John Jay and Sarah Livingston, compiled and edited by Landa M. Freeman, Louise V. North, and Janet M. Wedge, published in 2005 by MacFarland & Company, page 96. Read other posts by Sarah Jay HERE, HERE, and HERE. Because Sarah Livingston Jay and her husband John Jay were often separated during their marriage, they relied on their correspondence to convey information about their families and events of interest. Writing to John in Boston where, as Chief Justice of the United States Supreme Court he was riding circuit, Sarah expresses the value she attaches to his letters. And marvels at the possibility that each of them is writing to the other at the same time. It gives me pain to find that you have suffered from suspence that has been excited by your not hearing from us. It is very natural that silence on my part should occasion solicitude on yours, but I must assure you that your not hearing must be owing to accident, for I had the pleasure of writing to you a week after you left me, & expected that it wd. find you at N. Haven; & on my return from Eliz. Town [the Livingston family home in Elizabethtown, New Jersey] I again wrote & address’d my letter to you at Boston; since which Peter [their son] has likewise written; but I flatter myself that by this time you are convinc’d that I have not been negligent by the receipt of those fugitives. It gave me pleasure in perusing yr. last favor to observe from the date of it that we had both been engaged on the same day perhaps at the same instant in writing to each other. What a delightful circumstance! it is that our thoughts & affections are not bounded by the space we occupy, & likewise that by the invention of letters we can make each other sensible that they are not. The excerpted letter is from the Rare Book and Manuscript Library of Columbia University, The Papers of John Jay, ID6524. See other posts on the subject of mail and letter-writing HERE and HERE. See another post by Sarah Jay.